The Mahindra e2o has been available in the market since a few years now but the company hasn’t been able to move out the electric vehicle from showroom floors. 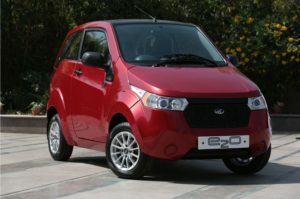 In a bid to generate more interest in its electric vehicle, Mahindra has now revamped the e2o and christened it the e2oPlus. The e2oPlus comes with some cosmetic changes and equipment upgrades over the older model, but the most significant addition are the 2 doors at the rear which make the EV more practical. Electric cars haven’t gained popularity in the Indian market and there is still a lot of time before them to gain acceptance here. In fact, besides the e2oPlus there are no other electric cars that are priced in affordable brackets and most other electric cars are positioned in premium segments. The new Mahindra e2OPlus gets certain upgrades in terms of design. The four door version of the car looks more well-proportioned than the regular e2O. The stylish front grille now gets Mahindra’s signature seven-vertical slats, like its other vehicles. It has a similar headlamp design of the 2-door version. The Mahindra e2OPlus is overall quite a good looking hatchback. The exteriors look premium and the car is well designed too. More importantly it is proportionate, like a proper hatchback. The 2-door version looked a bit out of place. The two extra doors at the rear make all the difference. The Mahindra e2OPlus is longer by 310mm to the E2O. The width is also increased by 61mm and height by 25mm. The front end is similar to the E2O-2 door , however it is the side and rear that are completely different. The car gets attractive and sporty looking 13-inch alloy wheels as well. This pleasant looking car is contemporary too. It gets projector headlamps, LED taillamps which are vertically mounted and also a rear spoiler. The biggest changes, however, are on the inside. The two-door e2o was surprisingly spacious in the back, but that was mainly because you expected it to be super-cramped. The e2o Plus, on the other hand, is properly spacious for its size. You have more than enough legroom in the front and back, and a good amount of headroom too. While three adults would find the rear a squeeze, two will find it adequately roomy. The seats too, are quite comfortable and offer good support. Boot space, at 135 litres, is not ample, but it is enough for two cabin-luggage-sized bags. The dashboard is the same as that of the two-door e2o, featuring an Android-based touchscreen infotainment system manufactured by Blaupunkt in the centre console, rotary knobs for the air con and a digital instrument cluster that displays vehicle speed, shift status, driving efficiency, charge percentage and the distance to empty. The e2o Plus also gets all-round power windows, electronically adjustable exterior mirrors and keyless go. Material quality, though, is a sore point. All materials in the cabin, ranging from the plastics and fabric to the switchgear feel a bit cheap. What you can expect though, is adequate performance to keep you entertained. Electric cars may have been born out of the need to make travel ‘greener’, but that doesn’t mean boring. Why? Unlike petrol or diesel cars, you don’t have to work your way through multiple gears to access the motor’s potential. All the performance is delivered in seconds. No gears = almost no transmission loss, and since the e2oPlus weighs less than 1 ton, it’s nice and zippy to drive. The top-end variant’s electric motor makes 30kW (around 41PS) of power and 91Nm of torque. That doesn’t sound like much, but as mentioned before there’s no working through gears or even waiting for a turbocharger to kick in to use what it has to offer. As a result, city driving is a breeze and with its compact size, it’s like a toy filtering through traffic. It’s quick off the line too, with a claimed 0-60kmph time of 9.5 seconds and the top speed is limited to 85kmph. Regular city driving is easily managed in ‘F’ (forward) mode and if you’re feeling impatient, just knock the gear lever down a click into ‘B’ for boost mode. As the name suggests, it bumps up the throttle response and the e2oPlus darts forward like a 3-month-old puppy, putting a mischievous little grin on your face. All said and done though, it’s very easy to adapt too. For reference, this was the first time I ever drove an electric car in my life. The traditional engine rumble is replaced with the electric motor’s mild whirring, and the only other noise present comes from the tyres or the AC. It feels strange at first, but you get used to it. The setup is tuned to offer good grunt at low to medium speeds, though understandably performance tapers off a bit as you build speeds, and top speed in fact is limited to 85kmph. After all, the car is meant to tackle bumper to bumper city traffic rather than quick highway jaunts. In terms of performance the e2oPlus clearly doesn’t feel lacking then, and you don’t really miss the engine as we know it. Where the e2o leaves you slightly wanting though is the handling part. It isn’t engineered to be driven like a hot hatch, and the steering wheel isn’t the best in the business to hold. It doesn’t offer much feedback either though it does feel rather direct and the e2oPlus is quick to change direction. The car feels slightly heavy around corners despite weighing less than a tonne, but the motor does a good job of offering ample drive exiting corners. Ride quality feels perfectly fine on smooth roads despite the stiffly sprung suspension but there are a few thuds when you get to rough sections or hit potholes. The e2oPlus could also do with sharper brakes, since the current setup doesn’t offer enough bite and you need to press the pedal harder to get the kind of retardation you want. The biggest hurdle for the e2o Plus or any electric car for that matter, is our charging infrastructure. The ultimate future foreseen when this car was getting conceived is just isn’t here. As a matter of fact, it’s nowhere in sight – there is no network of public charging stations at all. Also, the idea of charging EVs overnight is a far more difficult task than you would imagine given that a sizeable chunk of urban dwellers have only got on-street parking. The e2o Plus, then, may be the most ‘complete’ electric vehicle you can buy in India right now, however, it cannot be your only vehicle, at least not until we have a feasible charging infrastructure in place. Mahindra e2oPlus Ex Showroom Price in kolkata ranges from 7,57,425/- (e2oPlus P4) to 11,27,374/- (e2oPlus P8) .Mahindra e2oPlus has 3 Variants of Electric are available in India. Mahindra e2oPlus comes in 8 colours, namely Coral Blue,Spanish Red,Oceanic White,Eco Green,Arctic Silver,Sunfire Yellow,Wine Red,Solid White.